Part of my photographic arsenal includes four Alien Bees, studio strobes that can synchronize with my camera for night shots of moving trains. During the summer months they often don't get much use (mostly because it doesn't get dark until after 9:00, making for a long night), but as the autumn comes in and darkness comes earlier, they provide a nice way to make up for the shorter shooting time during daylight. Let's take a look at three recent shots. 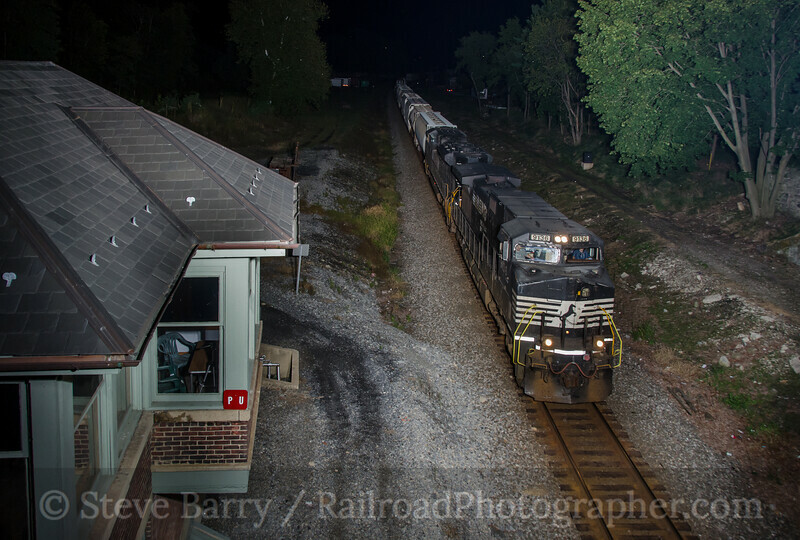 First up we head along Norfolk Southern's ex-Lehigh Valley main line in Phillipsburg, N.J., on September 7. Fellow photographer Tom Nanos was visiting from Connecticut, as since he is also armed with strobes we decided to head out for some shooting. The shot we had envisioned was from the Main Street bridge looking west, with the former Central Railroad of New Jersey passenger station in the shot. The first train to show up, however, was a westbound train, which made us head to the other side of the bridge for a tighter shot passing restored PU tower (above). While I have four strobes, this was done with only two -- one with a telephoto reflector aimed down at the train, and one with a wider-angle reflector aimed at the tower. The flash power on the tower was cut back to about half to avoid over-exposing the tower. About a month later Tom was back in New Jersey again and we went over to the former Reading Company passenger station and freight house at Belle Mead on October 7. A relocation project for U.S. Route 206 resulted in the bridge over the railroad being moved back a couple hundred feet and during construction the town took the time to begin making the area a historic district. Trees were removed from the south end of the passenger station and the grass gets mowed every now and then, but otherwise no funds have been allocated to further improve the property. We were looking for a westbound (geographically southbound) train here, and this time we were rewarded with one train in the proper direction. For this shot I used three strobes. Two were across the track from where I was standing, one pointed at the passenger station and another at the nose of the train. The third was just off to my right, throwing light on the end of the freight house and on this side of the locomotive. A few days later a coal train came into southern New Jersey to serve the power plant in Deepwater. One of Norfolk Southern's "heritage units" (locomotives painted in the livery of a now-extinct railroad that makes up the modern NS system) was the trailing locomotive on the southbound trip, but since the locomotives are run around the train for the return trip, the heritage unit -- painted for the Reading Company -- would lead north. We knew the crew was called out of Abrams Yard near Norristown, Penn., in the early evening and taken by van to Deepwater. 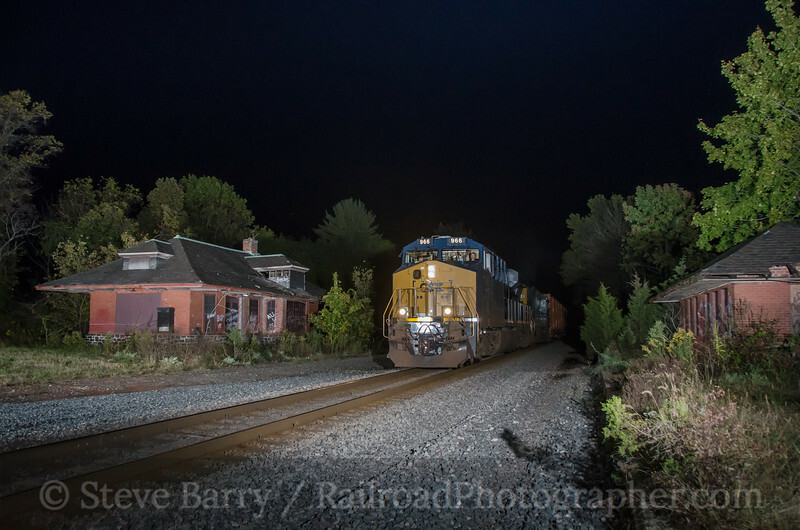 We (my brother Bruce and friend Mike Burkhart) watched as the crew arrived at around 10:00 p.m. and began putting the train together at around 11:00. Once it looked like the train was almost ready to head north, we went to downtown Penns Grove to set up. Bruce had shot a heritage unit here before, and the train showed up then at about 1:00 a.m. But this time 1:00 came and went with no sign of the train. Finally, we heard the dispatcher call the train on our railroad radio asking if they were ready to leave -- this was around 2:00 a.m. The crew responded in the affirmative, and about 20 minutes later they passed through downtown. This is a fairly small scene that required only two strobes. 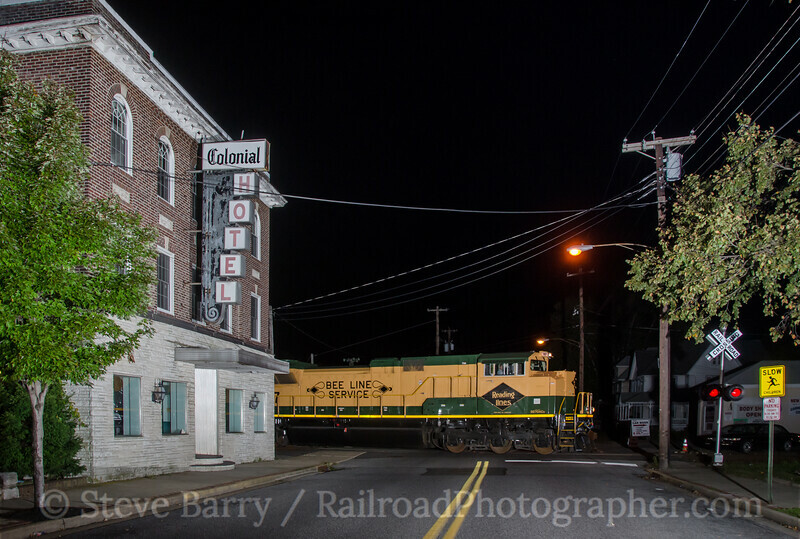 I had a wide-angle strobe set up on the right side of the street pointing at the Colonial Hotel, and a second strobe with a telephoto reflector set up on the left side of the street pointing at the train. Now that winter is approaching and darkness will be coming before 5:00, I'm looking forward to getting out more with the strobes. I've been exerimenting with this technique as well, and find it interesting to read how other people do it. With winter back again, I'll be out experimenting some more. I always wonder how traindrivers perceive these photos. I haven't gotten any negative experiences. Have you gotten any feedback?